It is still being used 32 years later! 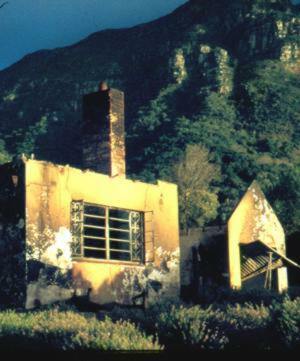 One of the disasters of the decade was a fire that destroyed the thatched Kirstenbosch Tea House on 7 August 1981. 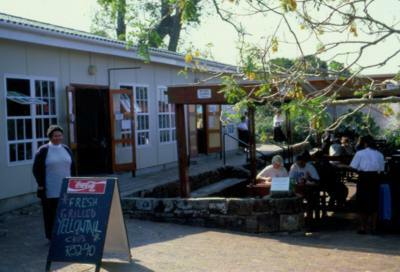 A temporary Tea House was erected on the same site and opened in December 1981, being operated by the Fall family who had become an institution at Kirstenbosch. This structure was also to remain in place for many years. Garden development continued. Eight months were spent in 1981 cutting and dressing 2000 pieces of Table Mountain sandstone to create the Fragrance garden. The following year the bridge made of Olea was constructed. 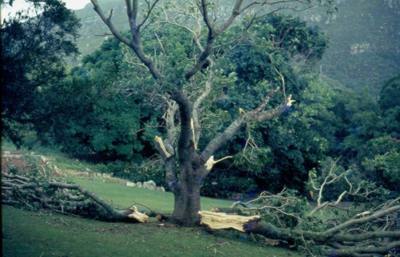 A storm also ripped through the Garden in 1984 causing considerable damage. 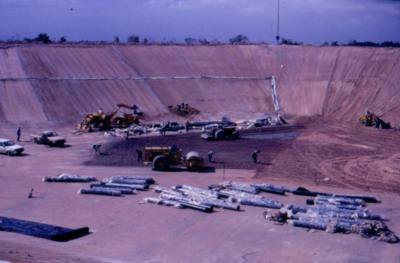 Water remained a problem, the dam liner installed in the 1970s, had ruptured. It was decided to redevelop the dam, enlarging it to almost double its size. The new dam was completed at a cost of R1.7 million at the end of the decade and has served Kirstenbosch well ever since. 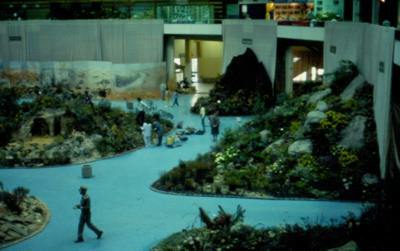 The Garden started using a computer in 1983 to manage its plant collection data. 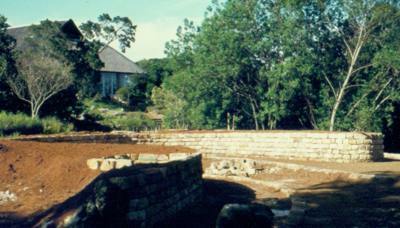 A scheme to build townhouses on the site later acquired for the development of the Kirstenbosch Research Complex was proposed early in the 1980s, but local residents prevented it. Kirstenbosch became part of the Table Mountain conservation area in 1983. Wildflower shows were very popular and Kirstenbosch was instrumental in arranging Flora ’83 and Flora ’88 which co-incided with the 70th and 75th anniversary of the establishment of Kirstenbosch respectively. The Annual Plant Sale remained very popular with some people queuing all night for rare cycads. The Transvaal, later known as Witwatersrand and now as the Walter Sisulu National Botanical Garden was established in 1982, bring the number of gardens to eight. Prof Brian Rycroft, instrumental in this expansion, retired after 30 years in 1983 and was succeeded as Director by Prof J.N. (Kobus) Eloff. In 1984 the National Botanic Gardens (NBG) came into being in terms of the Forest Act (Act 22 of 1984), its brief being to promote the conservation of and research into South Africa’s flora. On 1 April 1989, the National Botanic Gardens (NBG) amalgamated with the Botanical Research Institute (BRI) to form the National Botanical Institute (NBI).